The tribute honors the late and great Zellio Toppazzini, Reds “Player of the Century.” The two will be presented with the awards at the Society’s 10th annual reunion at Goddard State Park on Aug.1, stating a noon. Mayer, who resides today in Lincoln, arguably was one of the greatest goaltenders in the AHL during the 1950s and ‘60s. During his 14-year career in the league he won 346 regular season games and another 37 in playoff action. Forty-one (41) of his victories were shutouts and he posted a 2.91 career goals-against average. The diminutive Mayer backstopped the Pittsburgh Hornets to Calder Cup championships in 1952 and 1955. Five times in a six-year span he captured the “Hap” Holmes Award, presented to the goaltender with the best goals-against average. After his 7-year tenure in Pittsburgh, Mayer later played seven more seasons with Hershey (3) and Cleveland (2), and then finished off with two years with the Reds in 1963. Robertson, who lives in Woodbridge, Ontario, was a talented defenseman and unsung hero who played for eight different teams in his 13 seasons of pro hockey. That might label him as a journeyman blue-liner, but his five full seasons with the Reds are indelibly implanted in the minds of former local fans who remember the team’s success in the mid-1950s. Among the leaders of stalwart group of defenseman who protected goaltender Johnny Bower in the nets, Robertson helped deliver the Reds to two consecutive AHL regular season first-place finishes and their last-ever Calder Cup title in 1955-56. To earn “Tops Award” recognition a person must meet high standards set by the Society. He must have demonstrated outstanding leadership and performance in a R. I. Reds’ uniform, and must have established himself as a good-will ambassador for the Reds and the R. I. Reds Heritage Society. 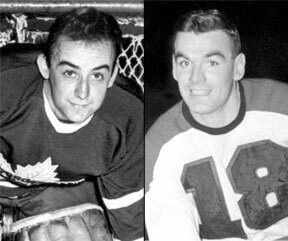 Goaltender Gil Mayer, left, and defenseman Bob Robertson will receive the 2010 Tops Award.